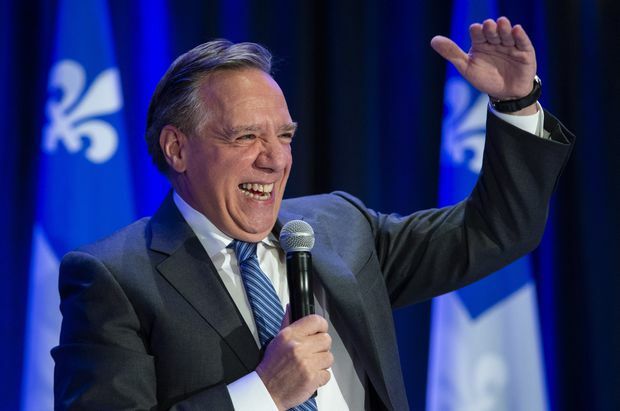 Oct. 3, 2018: Quebec premier-designate Francois Legault gestures as he addresses a meeting of his new caucus and defeated candidates in Boucherville, Que. The reference to headgear was an allusion to his successor, premier-designate François Legault, who said he might use the Constitution’s notwithstanding clause to bar public servants like teachers, police and judges from wearing religious symbols like the hijab. Prime Minister Justin Trudeau warned the new CAQ government to tread lightly on the use of the clause. On Wednesday, the CAQ held its first caucus meeting since the Monday election that brought the right-wing party to its first-ever majority. Mr. Legault spoke about how the party’s mission is to bring Quebeckers together. Mr. Legault inherits a relatively stable provincial economy, which could face rocky days ahead from the Canada-U.S.-Mexico trade deal that would open part of Canada’s protected dairy market. Here’s a closer look at the economic challenges the CAQ will face in government. This is only the third election for the Coalition Avenir Québec, a populist coalition of federalists and former separatists that François Legault, a former Parti Québécois cabinet minister, co-founded in 2011. 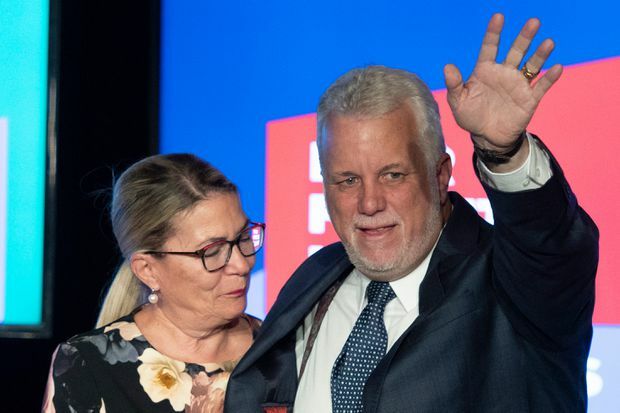 But this was also Quebec’s first election in four decades in which sovereignty wasn’t a campaign issue, which freed up traditional voting blocs – federalist and separatist alike – to change their allegiances. Mr. Legault profited from that upheaval more than anyone else: His party won traditional Liberal seats in the Eastern Townships, Outaouais and Montreal region, as well as PQ bastions like Lac-Saint-Jean. A jubilant Mr. Legault reached out to both sides of his new voter base on Monday night. “Today Many Quebeckers have demonstrated that it’s possible to make adversaries from yesterday work together for tomorrow,” he said in his acceptance speech. Quebec Liberal Leader Philippe Couillard waves to supporters as his wife Suzanne Pilote looks on, in Saint-Felicien Que., on election night. 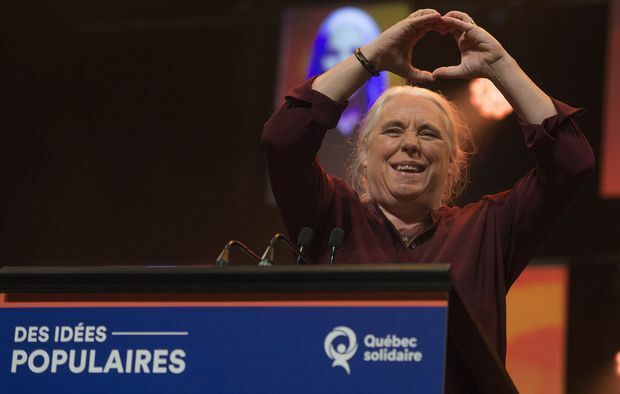 Québec solidaire's Manon Massé speaks to her supporters at an election-night rally in Montreal. The PQ, a dominating force in Quebec politics for more than 50 years, got reduced to fourth-place status in one of its worst election performances ever. It won only 17 per cent of the popular vote and just nine seats, short of the 20 per cent and 12 seats it needed to maintain official party status. Leader Jean-François Lisée lost his Montreal seat of Rosemont and announced his resignation, taking “a large part of the responsibility” for the disappointing result. Is Legault the premier yet? No, he’s the premier-designate. He officially becomes the premier when he and his cabinet are sworn in by Quebec’s Lieutenant-Governor, J. Michel Doyon. Please gently correct anyone who calls Mr. Legault “premier-elect”: There is no such thing in Canada’s parliamentary system, in which premiers are the leaders of parties or coalitions who have the most seats in their legislatures. No one is directly elected to the office of premier. Clarifying Quebec’s future policy on immigration, and convincing Quebeckers to support it, will be a major challenge for the CAQ government: Immigration to Quebec has grown over recent years, as indicated in the charts below, but the province has had trouble retaining immigrants in the face of competition from Ontario and Western Canada. That’s exacerbated labour shortages in the province that municipalities had hoped to fill with immigrant workers. Just as Quebec’s party leaders were wrapping up their last campaign day, Canadian and U.S. negotiators in Washington concluded a historic trade deal that will have big implications for Quebeckers. The proposed United States-Mexico-Canada Agreement, successor to the North American free-trade agreement, would open up a percentage of Canada’s protected dairy market to U.S. producers. Farmers in Quebec, the largest dairy-producing province, stand to lose a lot from increased competition and the end of policies that allowed them to sell surplus skim milk easily. All of Quebec’s party leaders opposed any softening of supply management, but it is now Mr. Legault who has to deal with the impact. Félicitations @francoislegault, the next Premier of Québec.